As usual, it was a treat in Chorale excellence, the hallmark of the Sixth Form Sisserou Singers presentations under the directorship and mentorship of Pearl "Aunty Pearl" Christian as they celebrated their 20th Anniversary with 'Chorale Memoirs' two weekends ago at the Arawak House of Culture. The Sisserou Singers embodies the best in Dominica when it comes to performance precision, discipline, and value for money, talent, dress and presentation. I will not attempt to give a "ball-by-ball commentary" on what took place that night as I too was spellbound by what I saw on stage. The introductory pieces appropriately gave thanks and acknowledged the Almighty, while not rendering judgement on any man. Past members of the Sisserou Singers members joined the current 'birds' in "Already Home" and "We give our Lives." Golda Scotland- Andrew was aptly entrusted as soloist in what was labelled Section 1A. Jarett Jean Jacques, Dominica's most talented musical pre-teen who earlier was part of a horn trio with Pious Jno Baptiste and Cameron Douglas having opened with a Pious-arranged National Anthem, served as the bridge between the various segments. Jarett has three distinctions and two merits with different wind instruments at grade five level with the Royal Schools of Music. He delighted the crowd on euphonium, trumpet, and slide trombone. Section 1B, dedicated to the late Nelson Mandela, treated the full house at the Arawak to solos by Webster Marie and Marie Pascale Affana. However, it was the latter who was the highlight for the entire evening immersing her heart and soul as she vocalised and internalized "Shadowland." What a performance! The section climaxed with the assurance that "Freedom is Coming" as Nelson Mandela's photo faded from the screens stage left and right. Tasia Floissac and Colette Ambo were soothing in the next section which featured pieces from the Disney animated feature- "Frozen" and the musical "Once on this island" Then section 1D, another favourite was dedicated to the late calypsonian Freddie " Man Himself" Mendes as Tasha P and Kareem Bertrand brought to life Hardline's " Calypso is my cure." Then the wonderful chorale rendition of the Man – Himself composition ( sung by Picky this year) "Time was when" was finally given justice for the masterful composition it is as the Sisserou singers dressed all in white, played up the vocal and performance antics of the late Freddy Mendes himself to the delight of patrons. Keeping true to their tradition of honouring persons who have dedicated and distinguished themselves in choral music, the Sisserou Singers honoured Mervin Alexander with an impressive citation before the intermission. Prior to the much anticipated, everyone's favourite, Caribbean Folk section, CARICOM's song contest winner and music Ambassador Michel Henderson- Delsol gave a stellar performance of her winning entry, now the CARICOM anthem to a standing ovation. We were also notified by the very capable master of ceremonies, Simeon Joseph, that Aunty Pearl had now formally retired as a Cultural Officer and the audience agreed overwhelmingly that she too deserved a standing ovation for her unwavering contribution to culture and, in particular, music in Dominica. She now certainly has joined ranks with Raymond Lawrence, Alwin Bully and the female elders Jean Lawrence Mathurin, Ophelia, Cissy Cauderion and icons of that musical/cultural ilk. Well, indeed the Caribbean Folk Section which highlighted the Madras wear presented compositions from Jean Lawrence Mathurin and Peal Christian herself. 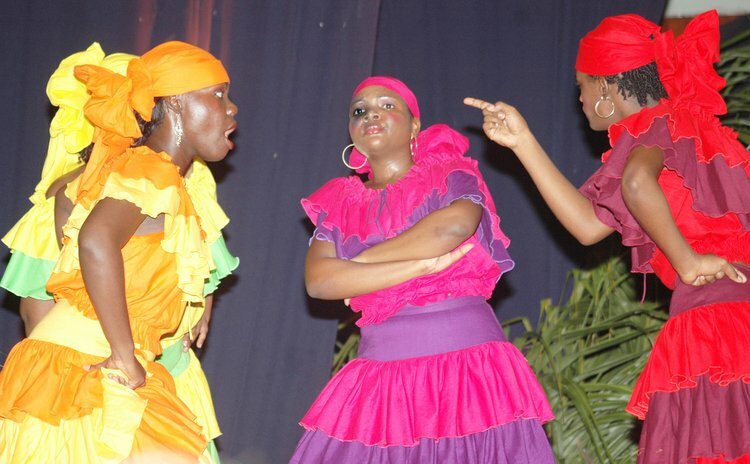 Popular folk songs as "Better Woman than you" and "Coconut Woman" from Trinidad and Jamaica respectively were interspersed with lively dramatised story lines of obeah, love, jealousy, beff and even "Jumbie in de road". The patrons were immersed as the rendition brought out vivid island tales amidst vocal excellence and precision. The facilities at the Arawak did not do justice to the performance; the air condition units did not seem to be working; the theatre floor needs to be re-done; the toilet facilities/ particularly the urinals are out-dated and do not provide any privacy; plus lighting and sound leaves a lot to be desired. Certainly such an investment is not too much to request for our only theatre facility on island. I looked at the demographics of the audience; it represented great diversity consisting not only of locals but scores of at Ross University students and other institutions were well represented. These patrons obviously wanted to experience the high standards that the Sisserou Singers have earned throughout the two decades of existence. Yet, again, there was an obvious absence of our contemporary young artistes who could learn so much from the organization, presentation and professionalism of a group of singers, dancers, musicians, and I dare say actors who have distinguished themselves as the best than this Nature Isle has to offer- CONGRATULATIONS SISSEROU SINGERS!! I Like it...I really like it!